Featuring the authors Vernon L. Smith, Laureate 2002, Nobel Prize in Economic Sciences and Professor, Chapman University; and Steven D. Gjerstad, Presidential Fellow, Chapman University; with comments by Dean Baker, Co-founder, Center for Economic and Policy Research. Moderated by Mark A. Calabria, Director, Financial Regulation Studies, Cato Institute. Balance sheet crises, in which the prices of widely held and highly leveraged assets collapse, pose distinctive economic challenges. In what promises to be a deeply insightful event, authors Vernon L. Smith and Steven D. Gjerstad will discuss their new book Rethinking Housing Bubbles. 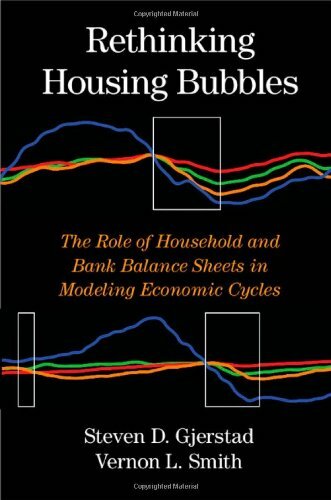 Their book examines causes and consequences, and with both authors’ well-known backgrounds in experimental economics, analyzes the events that led to and resulted from the recent U.S. housing bubble as a case study in the formation and propagation of balance sheet crises. The book also examines all previous downturns in the U.S. economy and documents substantive differences between the recurrent features of economic cycles and financial crises and the beliefs that public officials hold about them, especially within the Federal Reserve System. The book concludes with an examination of similar events in other countries and assesses alternative strategies to contain financial crises and to recover from them. Please join us for what promises to be a substantive, highly compelling discussion from two recognized authorities. Steven D. Gjerstad is a presidential Fellow at Chapman University in Orange, California. After receiving his PhD in economics from the University of Minnesota, he worked for ten years on theoretical and computational models of market price adjustment processes and on experimental tests of those models. His work on price adjustment has appeared in Economic Theory, Games and Economic Behavior, and the Journal of Economic Dynamics and Control. In the past five years, the emphasis of his work has shifted toward an examination of adjustment processes in the aggregate economy, with an emphasis on financial crises and economic restructuring. That work has been published in the Wall Street Journal, the Critical Review, The American Interest magazine, and the Cato Journal, as well as by the National Bureau of Economic Research. Vernon L. Smith was awarded the Nobel Prize in Economic Sciences in 2002 for his groundbreaking work in experimental economics. He has joint appointments in the Argyros School of Business and Economics and the School of Law at Chapman University, and he is part of a team that will create and run the new Economic Science Institute there. Dr Smith has authored or co-authored more than 250 articles and books on capital theory, finance, natural resource economics, and experimental economics. He serves or has served on the board of editors of the American Economic Review, the Cato Journal, the Journal of Economic Behavior and Organization, the Journal of Risk and Uncertainty, Science, Economic Theory, Economic Design, Games and Economic Behavior, and the Journal of Economic Methodology. He is a past president of the Public Choice Society, the Economic Science Association, the Western Economic Association, and the Association for Private Enterprise Education. He received his PhD from Harvard University.